Frequent flier miles are relatively easy to get, but they are pretty hard to use unless you’re going to Alaska in the winter or Phoenix in the summer. Availability is very limited, particularly to places where a lot of people travel and during peak travel times. After all, if airlines can sell the seats, they don’t have much incentive to give them away for free. As someone who likes to travel to nice places during peak times, it can be challenging to find free flights. It’s not impossible though, if you have a little creativity. 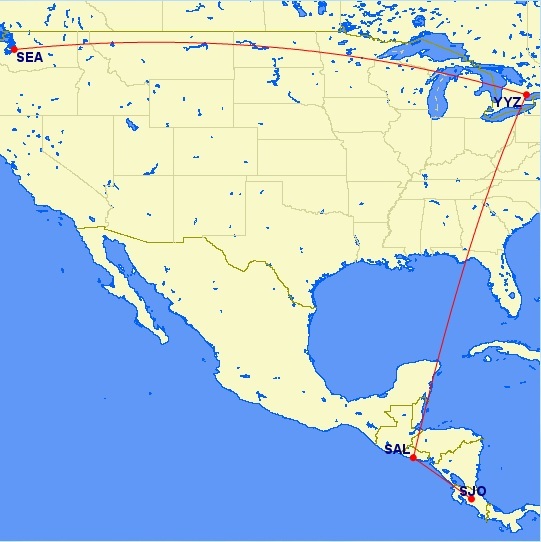 “I can get you to Costa Rica,” said the US Airways Dividend Miles agent, “but I can’t get you back to Seattle. I’m just not finding anything.” I wasn’t surprised. I was signed up for a 4 month academic exchange at the top business school in Latin America, and I didn’t want to pay for an expensive ticket to Costa Rica. 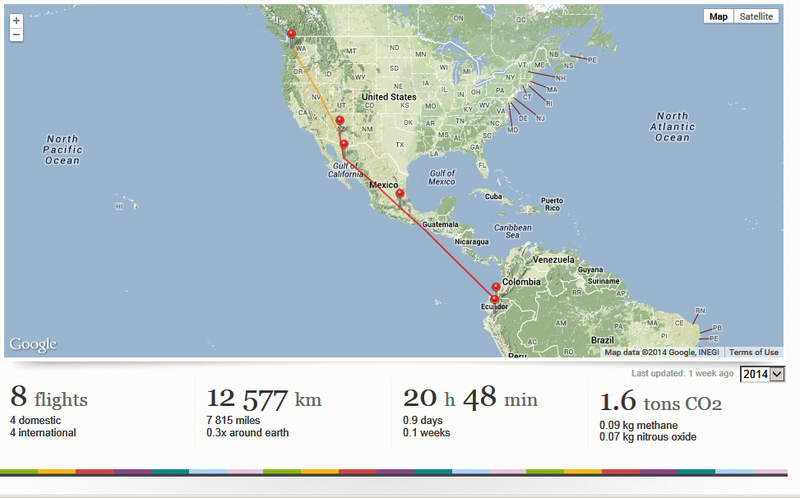 I would be leaving from Seattle, flying to San Jose, and then returning two days before Christmas. US Airways telephone agents are pretty friendly and most of them I have spoken to genuinely want to help you get where you’re going. The company more or less gives them the latitude to help people, because everyone using them is paying a booking fee so the service is paid for. However, most of the agents formerly worked for America West, a fairly small airline based in Phoenix with few international flights, and agents are sometimes not very familiar with US Airways partners or geography. Additionally, their computer system only looks for direct routings (a very common scenario). This means a lot of potential options don’t show up. I also looked at the routing rules. Flights to and from Central America are not allowed to route through South America, but can route through Central America and/or North America. This meant that in order to get to and from Costa Rica, I was allowed to make any number of connections in Central America and North America necessary to get back to Seattle. US Airways was out. No availability to Seattle via Phoenix. United was also out, no availability via Houston, Newark or Chicago. Copa could get me as far as Miami, but this isn’t a hub of any StarAlliance carrier in the US and there was no way to get to Seattle from there. Yes, I wanted to book it. I could use my Marriott points to stay overnight in an airport hotel. Later, this turned out not to be necessary, because there was a very significant schedule change in my itinerary. This is a get out of jail free card allowing an award ticket schedule change (note that this is the only reason that US Airways will change an award ticket after your trip has already started). I watched seat availability like a hawk and as soon as a seat opened up on the Toronto-Seattle flight on the 23rd, I grabbed it. Sure, it was a little out of the way, and I had a 6 hour layover in Toronto, but my trip took only one day and–most importantly–I flew for free and I did it during the peak Christmas travel period. All I paid was tax on a ticket that would have cost me over $1200 (via the most direct route) if I had paid cash. I just had to think outside of the box a bit. Most Americans don’t think of Avianca and Air Canada as their first choices to Central America. Fast forward to today. I will be flying from Kunming to Los Angeles in May, using an Aadvantage award seat and flying on Cathay Pacific. 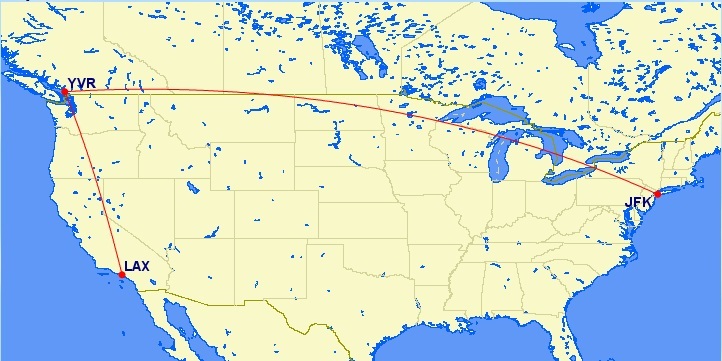 I plan to attend a conference this July in New York, so I took advantage of the free one-way domestic award loophole that is available with American Airlines international itineraries. On international Aadvantage awards, American Airlines allows one stopover in the North American gateway city. If you are flying with Cathay Pacific, this means you can stop in Vancouver, San Francisco, or Los Angeles on the way to your final destination. American further allows you to use any partner airline to get to your final destination from the North American gateway city (this is different than some other airlines, which only let you fly on their own planes when you use one of their partners). I was hoping to find a red-eye flight leaving on a Thursday night, so I wouldn’t need to spend money for a hotel on Thursday for a Friday-Sunday conference. Unfortunately, the only flight that American had available was a flight leaving at 6am, connecting in Dallas, and going to Newark. I do not like taking flights at 6 in the morning, and I do not like connecting in Dallas. However, American Airlines allows unlimited changes to Aadvantage award tickets as long as you do not change the origin or destination cities, so you can grab a flight that isn’t ideal (so you at least have something) and then tweak the itinerary if something better opens up. I was happy to pay $35.10 to avoid a 6am departure from Los Angeles and a connection in Dallas. I also expect to get a decent night’s sleep on an internationally configured Cathay Pacific flight. And I will have a few hours to enjoy a nice dinner in Vancouver and maybe even visit friends before the flight. And all of this for remembering our polite Canadian neighbors and all the excellent additional flight options that their airports can provide.